Season 5 of ‘Botched’ Premieres December 6 on E! E! 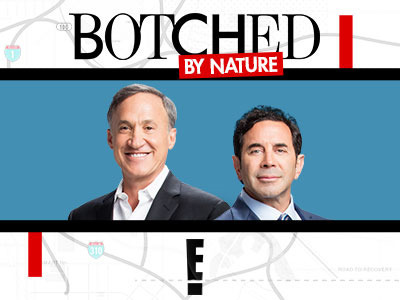 Entertainment announced the popular series, "Botched" will premiere season 5 on December 6th. The network has also greenlit the series for a sixth season. "Dr. Terry Dubrow and Dr. Paul Nassif will continue to change the lives of their patients as they come face to face with the most complicated reconstructive surgeries they've ever been challenged," says E! 's press release. In the season premiere episode, singer-songwriter "Tiny" Tameka Harris supports her best friend hoping Dr. Dubrow can help her with a botched breast augmentation. 'Botched' Returns with New Episodes May 9 on E! Tomorrow night, season 4 of E! 's "Bothched" returns with the mid-season premiere with all new episodes! Plastic surgeons Dr. Terry Dubrow and Dr. Paul Nassif continue to share their expertise with even more inspiring and challenging cases. Over the course of 4 seasons, the doctors have performed reconstructive procedures, some nearly impossible, in an effort to transform the lives and restore the confidence of patients desperately in need of both. ‘Botched’ Returns with New Episodes Sunday Night! The famous doctor duo is back with E! 's hit plastic surgery series "Botched" mid-season return June 18th. Dr. Terry Dubrow and Dr. Paul Nassif are back in the OR to work their magic helping patients with complex cases who have suffered from botched plastic surgeries. E! announced the hit plastic surgery series, "Botched" will return for season 4. The legendary plastic surgeons Dr. Terry Dubrow and Dr. Paul Nassif are putting their surgical skill to the test once again. In the all new season, the doctors will see new patients looking to correct the damage done from botched plastic surgeries.